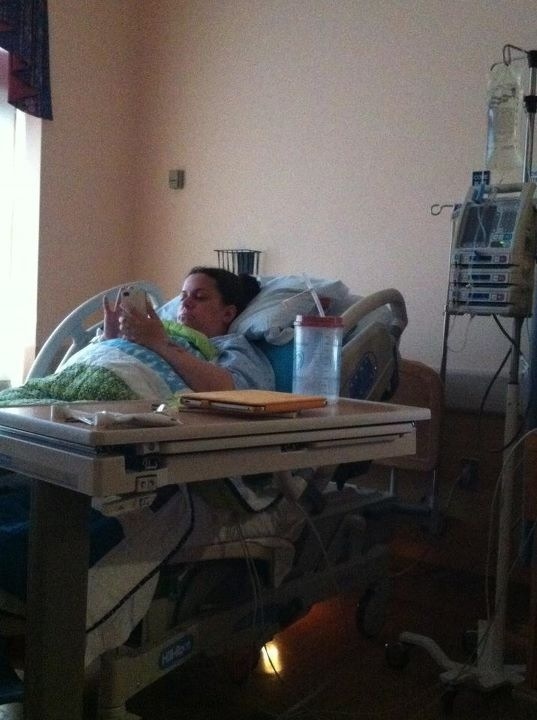 So we checked into the hospital the night of Monday the 12th so I could be induced for medical reasons, the doctor didn’t want to wait too far past my due date (which was Friday the 9th). We’ve now hit the 40 hour mark of waiting here at the hospital. Day One of induction didnt take and Day Two isn’t very eventful yet, either. Except lots more pain and discomfort. But H is perfectly happy where she is and has shown no signs yet of wanting to come meet everyone. I’m in love with this custom 16 x 20 print we bought from Arthur’s Plaid Pants for H’s room. I love everything about it. I love how NJ is like Godzilla to the entire UK, I love that it’s pink and grey, I love that it’s a piece of H’s whole heritage, I love that Northern Ireland is floating on its own out there. Jen did such a terrific job on this, my only regret is that I didn’t think to take photos of the print before we framed it and hung it up. Made it a bit tricky to get a decent shot without my entire reflection in the glass. But I think you get the general idea, this is one of my favorite touches in the baby’s room. This weekend I finally finished the ottoman I was working on for the baby’s room. It’s another Amy Butler Gumdrop, the 3rd one I’ve made. I love this pattern, it comes together quickly and holds up really well to abuse. 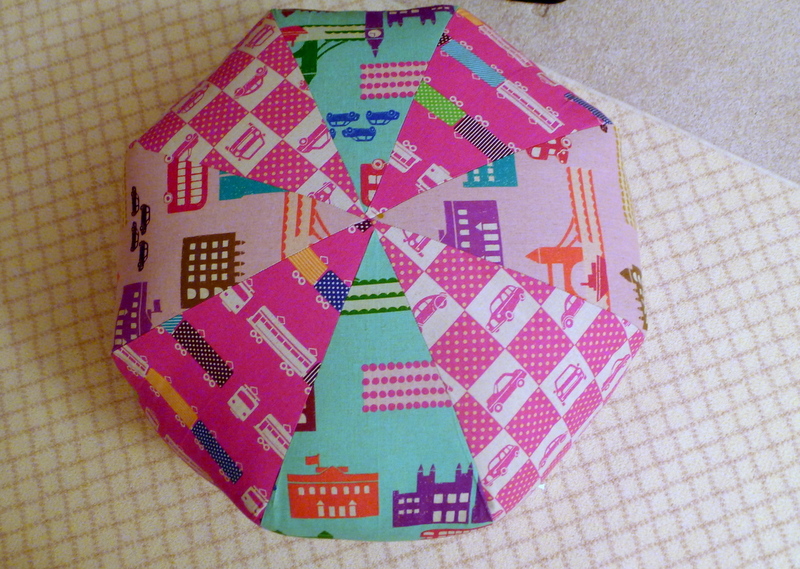 I didn’t add the patch on the top for this one, I liked the mismatched seams and slight pattern. Today Adam and I hung this tree from Couture Decals in the baby’s room, and I’m in love with it. Jayne did such a great job helping me customize the design to match our color scheme and style. I’m only posting photos of the tree, but some of the birds are scattered around her room, I’ll post those the next time I update the overall progress on the nursery. Other posts on this project: H Banner Pt. 1. It’s all finished and hanging in the nursery, and I love how it came out. 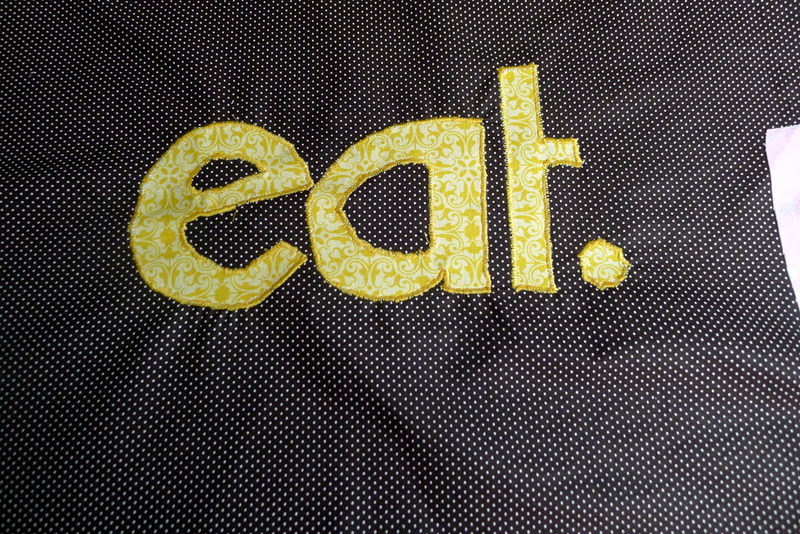 After I fused the letters onto the background fabric, I satin stitched all around them. 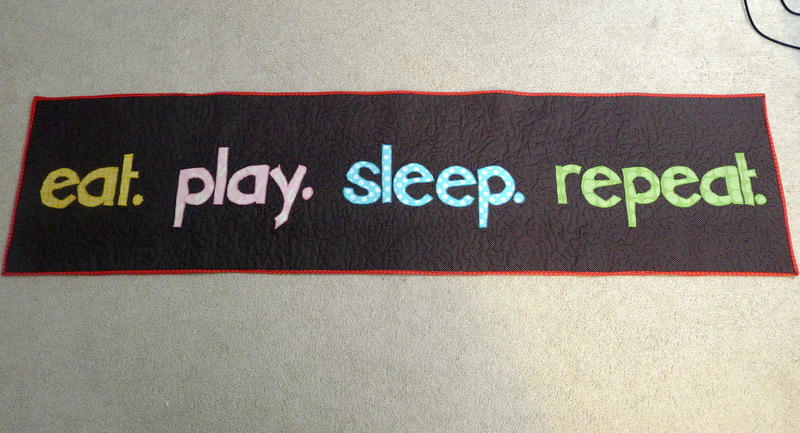 My Bernina doesn’t get as dense a stitch as I wanted, but I actually still love the way it looks. Other Baby’s Room posts: Baby’s Room Pt. 1, Baby’s Room Pt. 2. We bought these curtains, and Adam hung them up last week. They are true blackout panels, it’s pretty impressive how dark this room gets. 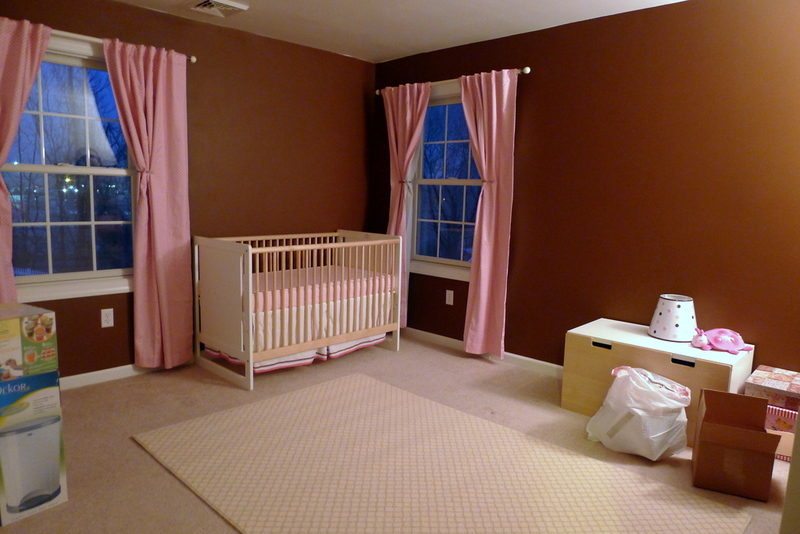 Other Baby’s Room posts: Baby’s Room Pt. 1. 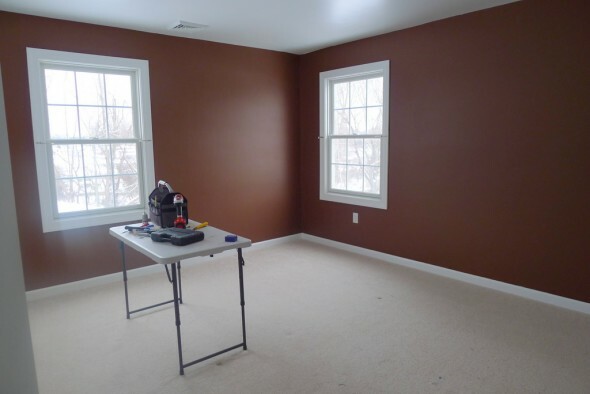 Two walls are Benjamin Moore’s Leather Saddle Brown. 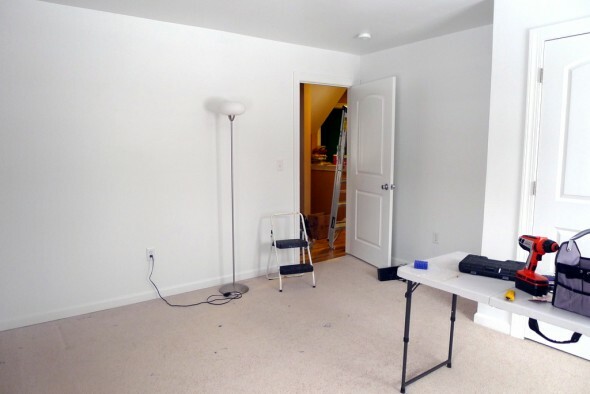 Two walls, the ceiling, and the trim are Benjamin Moore White. Just…white. 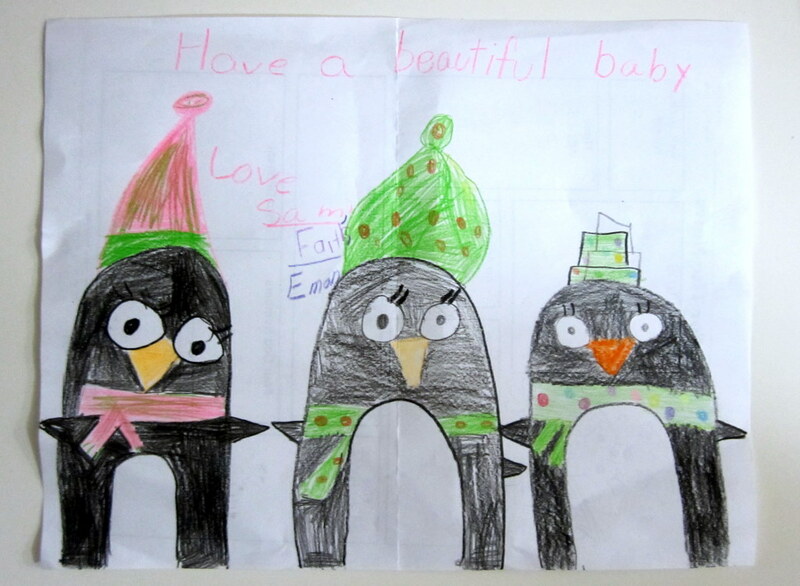 Three of my 2nd grade girls presented me with this drawing on Wednesday, and I wanted to hug them but thought I would burst into tears. I’m 33 weeks now and highly emotional. I will hug them next week, when it doesn’t take me by surprise. Last weekend Dan and Ken came over to help Adam tackle the guest room, which from now on will be H’s room. We still have some painting to finish, but here are some photos of its transformation so far.